On March 10, 2016, Warwick Valley High School’s Varsity Crew Team took delivery of their first 8+ racing shell. Thanks to the warm weather, the team was able to get the boat out on the water immediately. The purchase of this boat is very special to the WVHS Crew team. The boat represents countless hours of hard fundraising work, and offers more team members the chance to race. The team will continue their fundraising efforts with a “can shake” on Saturday, April 9 outside ShopRite in Warwick, from 9 a.m.-3 p.m. Please stop by to meet members of the team, and wish them luck on their first race of the season, to be held on Sunday April 17 in Poughkeepsie. 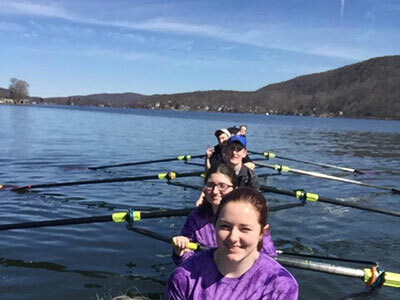 You can follow the Warwick Valley High School Crew team on their website, http://www.wvhsrowing.org, on Instagram at @Warwick.Crew, and on Facebook at Warwick Crew. WVHS Crew Team’s equipment purchases are completely self-funded. Warwick Crew would like to thank all the donors who made it possible for them to acquire this boat. Warwick Crew is coached by Jim Cody, and assisted by many volunteers who put in countless hours to work with the nearly 50 student-athletes on the Crew Team. Go Wildcats!